“Justice is not high enough up the political agenda” a Catholic Labour MP told the annual gathering of the National Justice and Peace Network of England and Wales at the weekend. John Grogan of the Keighley Constituency in Yorkshire singled out benefit sanctions as a key area for advocacy work. He praised his local SVP for supporting disabled and vulnerable people suffering because of the cutting or withholding of benefits, and urged his audience of around 200 J&P activists to stay engaged with poverty issues and “don’t give up on democracy”. 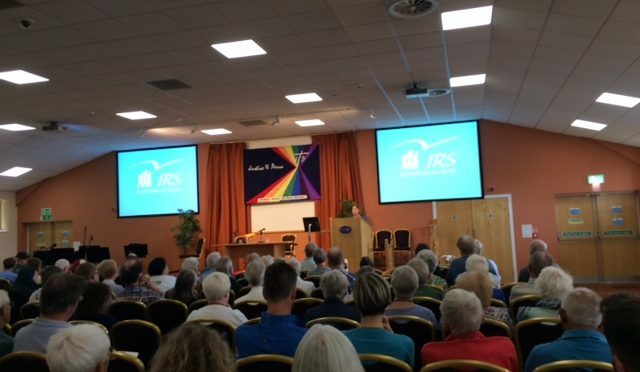 The 40th conference of the National Justice and Peace Network (NJPN) in Derbyshire took the theme, ‘In the shelter of each other the people live’ and explored building a Church and a society with the marginalised, the excluded and the most vulnerable at its heart. John Grogan’s session was chaired by Fr Colum Kelly of Apostleship of the Sea who ministers to seafarers at the port of Immingham and officiated at the conference Mass. He lives at the docks and feels that, “if we are to minister to those in need we need to go to where the hurt is”. Many seafarers are away from home for nine months or 12 months at a time. “A lot of what we do for the seafarers are small gestures – by coming on to the ship or giving them some phone cards, Sim cards, or something that can give them wi-fi access,” says Fr Colum. He hoped the Church will fully embrace the inspiration of Pope Francis and his call for the Church to be a “field hospital”, outgoing and responsive to the needy. Sally Ruane’s workshop on ‘The Importance of Public Services’ highlighted the lack of Church political action on saving the National Health Service and on controversial social security reform. The longstanding NHS campaigner from a Leicester parish felt the Church should challenge “the transfer of resources away from poor people” and that “we musn’t go back to a hotchpotch of healthcare”. Church leaders should be more attuned to the impact of austerity measures, she said, but laity too should “take more social responsibility”. Other keynote speakers also highlighted to plight of vulnerable groups in Britain today. Sarah Teather of the Jesuit Refugee Service (JRS) spoke of asylum seekers getting more destitute in a UK asylum system that is “profoundly flawed” and marked by “deliberate cruelty”. JRS has seen the criminalisation of those seeking work and reduced access to legal aid, but she said that “amidst the uncertainty they have the certainty that we are with them”. JRS accompaniment includes giving money for bus passes, hot meals, visiting people in detention, and the friendship of simply listening to people’s stories, something Cardinal Vincent Nichols did last weekend at a JRS Centre. Theologian David McLoughlin of Newman College in Birmingham called for the Church to see its mission as tackling injustice and endorsed the inspirational leadership of Pope Francis in calling for “a poor Church committed to the poor”. Rev Al Barrett, a Church of England Vicar in a Birmingham parish, spoke energetically about being transformed by community-building and empowerment work in a poor area. He worked to shift the language from stories of deficits and lacks to stories about unearthing and connecting the diverse and abundant gifts of the neighbourhood. He called for justice rather than charity, and said he admired Brazilian bishop Dom Helder Camara who spoke of this in his Latin American context. Beautiful liturgies, incorporating Justice, Peace and Ecology were led by the Marshall family of Chesterfield. The opening hymn on the Friday was the Marty Haugen hymn with the opening line, “Let us build a house where love can dwell and all can safely live”, encompassing the vision of the conference. On a hot Saturday afternoon 45 people set off on a ‘Share the Journey’ walk, led by Maria Elena Arana of CAFOD. Saturday evening saw a showing of a film about Archbishop Oscar Romero of El Salvador, called ‘The Claim’. The Archbishop, who showed extraordinary compassion for the poor and was martyred in 1980, will be canonised later this year and is a patron of NJPN. Around 30 organisations had stalls in the Just Fair. At the Christian CND stall participants wrote messages on white paper doves to be sent to Prime Minister Theresa May about the new Nuclear Ban Treaty. One said, “We are waiting for your response to the UN Treaty on the Proliferation of Nuclear Weapons. Don’t disappoint us!”. Drinks at the conference were taken from reusable cups and food provided followed the LOAF principles – food that is Locally sourced, Organically produced, Animal friendly and Fairly traded. Vegetarian sausages for breakfast are particularly popular! Actions identified at the end were generated in 15 workshops. The Pax Christi workshop on violence, led by Pat Gaffney, prompted a challenge to the culture of militarism and to the British government selling arms to Saudi Arabia. It also called for letters to the Foreign Secretary urging speaking out against the destruction of Bedouin communities in the West Bank. A workshop on interfaith outreach, led by Columban Jim Fleming who worked for several decades in Pakistan, called for a valuing of differences and building community collaboratively. Fr Dan Mason, the National Chaplain for Gypsies, Roma and Travellers, led a discussion on ways the Church could be more supportive and welcoming of travelling people. The Medaille Trust suggested ways of tackling slavery in our society. Catholic environmentalist Mary Colwell highlighted how ‘home’ is changing for wildlife due to climate change and distributed copies of her latest book on curlews. An NJPN 40th anniversary oak tree was planted in the conference grounds and then participants perused of the 25th anniversary tree which is now 20 feet tall! The link below will take you to the home page of Liverpool NJPN, where Stephen (one of their members) has posted 8 videos, showing the 4 talks by our excellent main speakers this weekend. Each is split into two parts [the second usually being the Q&A after the talk] this keeps each video below the one hour mark.